I love this time of year, especially as things start gearing up for CES and Pepcom, which always delivers with some interesting gadgets for us to play with. 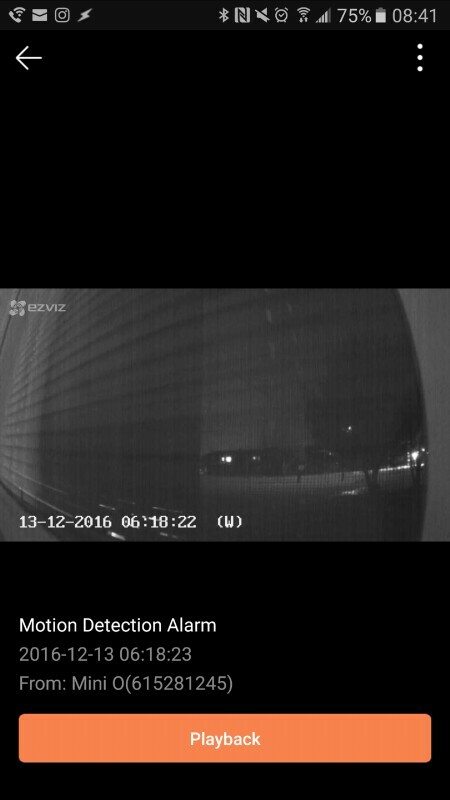 This year is no exception as TOV gets to test full rounds of IP cameras just before the holidays, with three company from the company EZVIZ. 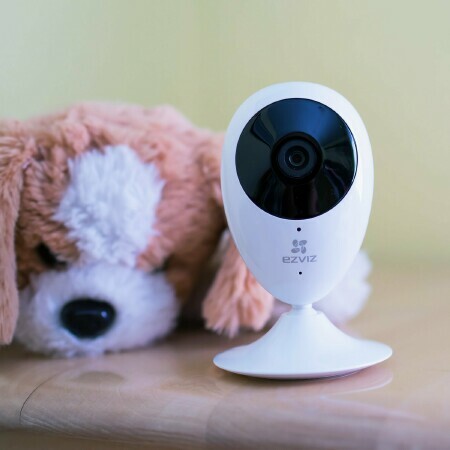 The first review of three will be the "Mini O 720, an IP-cam" for the indoors, with built-in two-way audio, IR LEDs and, an 111-degree angle of coverage. The Mini O is built small and unobtrusive, only standing at 5.04” and at its widest 2.28”..
From beginning to end, the installation of the Mini O took about ten minutes. Before you get started, it’s a must that you ensure you’re on your home 2.5 GHz Wi-Fi (the Mini O can also connect to 2.4 and 5 GHz bandwith), know the network password and plug in the device. 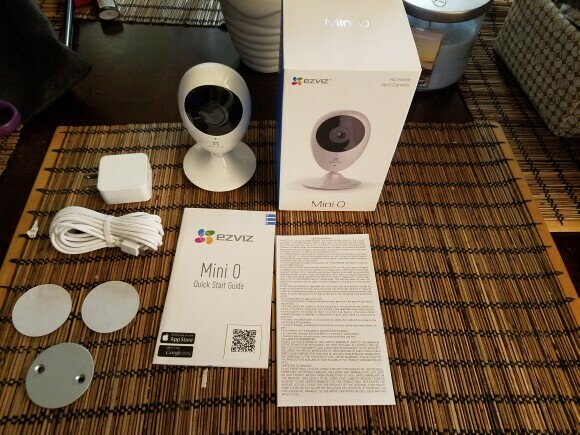 Once the hard part was done, everything else was cake; you simply download the app via Google Play or iTunes App store and create an EZVIZ Life account. And here's a tip - on the app press "+", scan QR barcode, and do yourself a favor by writing down or memorizing the verification code, which also accompanies the QR barcode on the base of the MINI O. One last thing: keep your phone two inches from your camera and Sync. Wait two minutes and you’re pretty much done as the entire process takes approximately five minutes. Inside the box are two adhesive strips and a mounting plate; with the adhesive strips you can stick it on anything that you can’t drill into and they will hold as long as the surface isn't too porous. I would recommend using the strips if you live in an apartment and drilling holes isn't an option (due to lease/deposit reasons). Now, what I did was use the adhesive strips to figure out where to place the cameras, test it out for a few days, and then drill. Measure twice, cut once. Side note – if you have problems getting your camera to connect you can generate a QR barcode on your phone for your device to scan and it will attach to your network via that route. 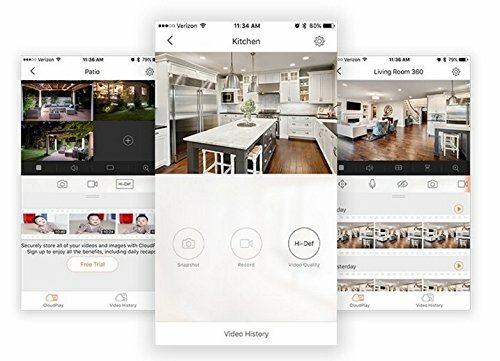 Now, the EZVIZ app comes with many standard features that most security camera apps include such as two-way communication, IR LED, Digital Zoom, and motion detection. 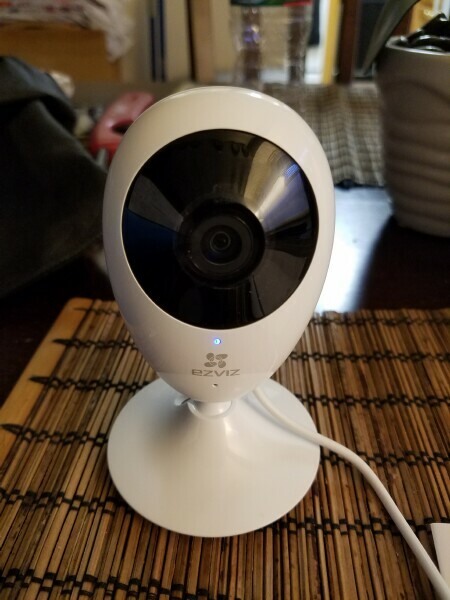 Where the EZVIZ app shined for me was the UI, which was so simple that I could easily view something via the app, and as I’m watching I could press record, download video, or take images and store it on my phone. One other thing I really liked is while I’m watching my videos, if I need to zoom in, it's not a problem and if you put your camera settings to Hi-Def you get an amazing picture but at the cost of space on the SD card. But if you're willing to sacrifice quality for more storage, you can opt to choose Standard or Basic recording, which will still give you a decent picture but it will take up a lot less room. While on the subject of recording and storage, the Mini O can take SD cards up to 128GB. Since I don't own a card of that capacity, I went with a spare 32GB, which provided plenty of space. If SD cards aren’t your thing you can also go with the "EZVIZ Cloud Service", which is an easy way to store and watch your videos safe and encrypted. I'd recommend this as it's a great way to protect against data loss if ever the camera is destroyed due to water or fire and important information will go with it. The cloud is free for seven days giving you a chance to become familiar with the service and then becomes a monthly paid subscription. You can add as many cameras as you like and share or retain videos as needed. One neat feature included in this service is a daily recap as it will create a quick snippet of all the footage taken that day. I wanted to touch upon one key feature of the Mino O - the motion detection, and notifications, as it provided a quick response regardless of being on the app or web portal. It's great but it did get annoying at times due to their being so many. The camera, even in its lowest setting, is a bit sensitive. So, when I first set it I made my assumption that no one was home and placed the camera in position. No sooner was it up and running was when I started getting false motions notifications and tons of recordings. As it turns out, the Mini O picked up movement from a shadow of a tree outside. So, I had to turn down the sensitivity and it appears to be working great. But on occasion, even at night, it will push a motion notification when none can be found. But I’m ok with that. The Mini O is a pretty solid entry-level camera that's very easy to set up and, in Hi-def, gives you a clean picture. What sets it apart from the likes of REMOCAM, in my eyes, is the app and web portal, which really kicks things up a notch with all of its features and functions. 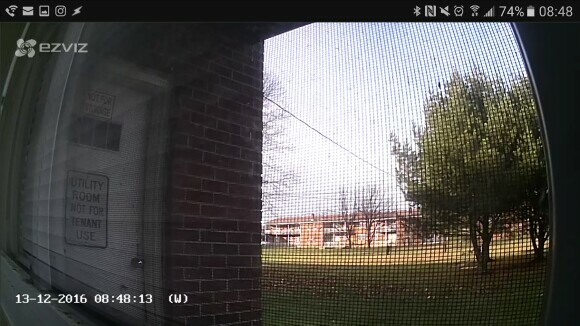 I was impressed with how easy it is to capture video and images to my phone, then be able to share to the app of my choosing. If I needed to view past videos on the sliding timeline scale (available on both the app and web page), it gave me quick access and ease of adjustment in seconds, letting me know how much time elapsed between videos and how long each video was, which is helpful information when plotting timetables and events. Finally, I love when things can be connected via IFTTT (If you’re not sure what IFTTT is, just click here) as it comes in handy bringing all your wireless devices together. 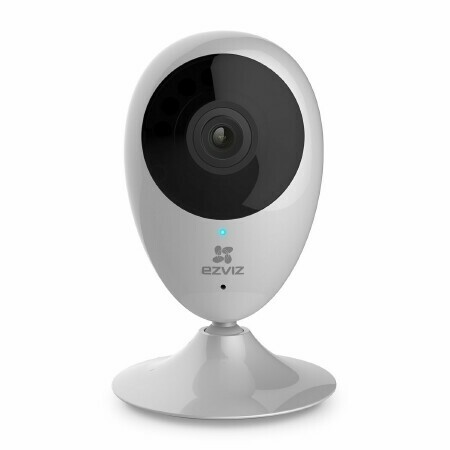 The best part is that EZVIZ has a whole section dedicated to IFTTT and setting it up. I wish more and more Camera companies took things like IFTTT into consideration when building their protocol. The Mini O kit doesn’t come with screws, so you will have to provide your own, which I found very strange. 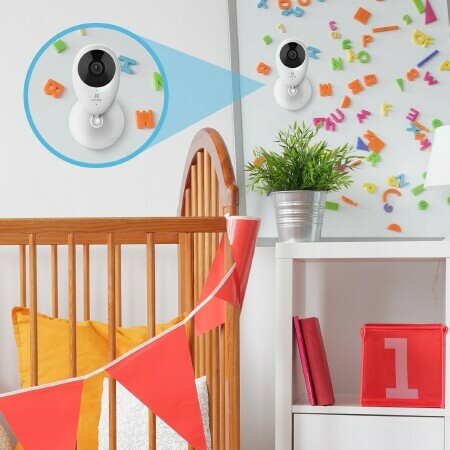 Next, In my scenario, I have multiple cameras and the one thing I haven’t been able to figure out is how to sync the clocks to the cameras as they are a few seconds off. It’s not something that's critical just annoying to me.